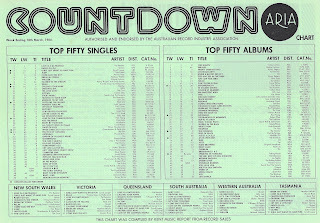 The ARIA singles chart was a bit of a funny one this week in 1984. 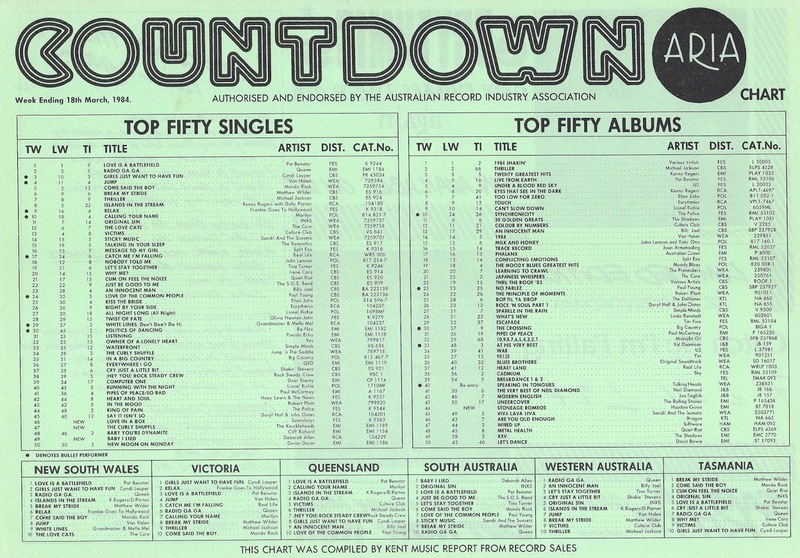 Three of the songs that entered lower down the top 100 would re-enter later - two going on to much greater success next time around. The other two top 50 misses were minor hits by male singers who'd seen much better days on the chart and would do so again. As for the debuts in the top 50 - I've never heard any of the three songs until now, and I don't feel like I was missing out on too much. But hey, not every chart features a flood of future top 10 singles. There wasn't even a new number 1 single this week in 1984, with "Love Is A Battlefield" by Pat Benatar holding firm for a fifth and final week. 1984 would be a big year for the man behind 1982 chart-topper "The Other Woman" - but it wasn't because of this synth ballad, the lead single from his Woman Out Of Control album. It'd been almost a decade since Slade's last top 100 visit with "Far Far Away" (number 17 in 1975). Ballad "My Oh My" returned for seven weeks in September, but didn't beat this initial peak. This 1979 single by Bob Seger finally charted in Australia thanks to its use in Risky Business, but it'd really take off three years later, climbing all the way to number 3. Like "Crumblin' Down", this second single from Uh-huh was a US top 10 hit that didn't connect locally. It was inspired by a literal pink house and was another of JCM's comments on the state of the US. Also this week, "Jump (For My Love)" by The Pointer Sisters debuted for a six-week run, peaking at number 79. But, we'll look at it when it re-enters the chart in August. When I saw this listed as a new entry on this week's chart, I got excited. "I didn't realise Lydia from Fame had a chart hit," I said to myself. Well, Debbie Allen didn't. Country singer Deborah Allen did - and performed especially well in South Australia, where it was the week's number 1. "Baby I Lied" was also Deborah's only mainstream hit in the US, where it peaked five places higher. The ballad is pretty unremarkable - the start of the chorus reminds kind of reminds me of "Don't Turn Around", but that's about all I've got. I warned you a couple of weeks ago there'd be another version of this novelty song coming and here it is. Canada's The Knuckleheads took on the original by Jump 'n The Saddle (which rose to number 34 this week) and came off second best - although music was the real loser here. We started with Ray Parker Jr, who'd have a huge 1984, and we finish with a band for whom it would also be a significant year - but for all the wrong reasons. "Love In A Box" was released just ahead of Sunnyboys' third album, Get Some Fun, which had been recorded in the UK. Unfortunately, the single peaked two places lower than 1983's "Show Me Some Discipline", which was also included on the album, and the album only reached number 36. The downturn in their chart fortunes can only have exacerbated the conflict already present in the band and that, together with singer Jeremy Oxley's personal problems, led Sunnyboys to break up in the middle of the year. Of course, they'd be back in 1988 and every so often ever since, including for a series of shows last month. Next week: after a couple of weeks of pretty average new entries, four big hits make their debut - including a cover version that featured the original performer in the video, the biggest hit by a misleadingly named new wave band and a local one-hit wonder. The Pointer Sisters & Bob Seger tracks are the only of this week's entries I knew. The Ray Parker Jr. track is pleasant, if not spectacular.